Crystals and Gemstones: Amazonite - A soothing stone that relieves fear and anxiety. Amazonite - A soothing stone that relieves fear and anxiety. 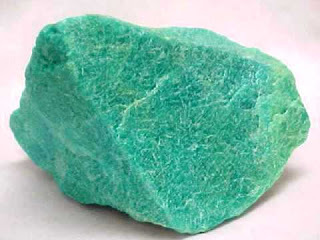 Amazonite, is a very beautiful and calming stone,wonderful to bring in new prosperity to any business. 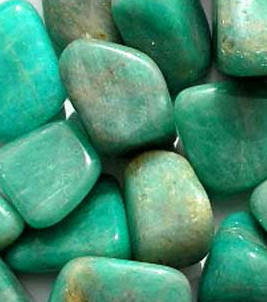 Considered a stone of luck,it is wise to have an Amazonite with you for gambling purposes placed in your left pocket! Wonderful for new inspiration, business success and any financial ventures. Amazonite is also wonderful at balancing emotions, and works specifically with the Heart Chakra, Throat Chakra and even the Solar plexus Chakra, and helps you to feel worthy and very calm. It energizes the words you speak,so they radiate at a softer tone-but get the message across. Aids in clearing you from electromagnetic negativity,so it is handy to have near your computers, microwaves and cell phones. Amazonite brings strong healing to the nervous system,which effects more people then you may think. It will begin also,to regulate the cells in the body-and even heal the tissues in the brain,and surrounding cells! This is amazing! 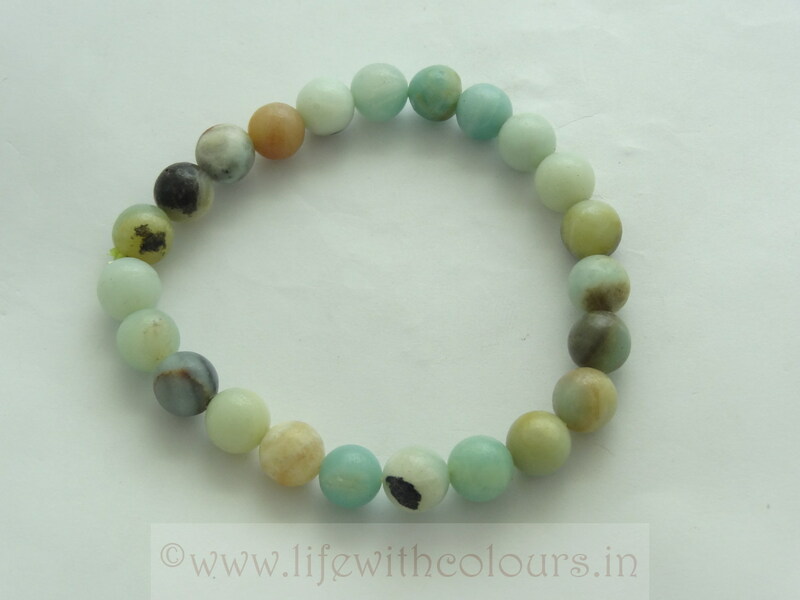 Amazonite is primarily known for having a soothing effect on the brain and nervous system. The result is relief of fear and anxiety, and an increase in courage. It is also believed to bring happiness to married life, presumably because your personal anxiety harms your relationships with others. Amazonite is also believed to be good for your skin. We all know from experience that anxiety can cause outbreaks and accelerate the ageing process, but Amazonite relieves that anxiety. If you are a person who's too high-strung, overly nervous, and prone to stress, Amazonite may be an important gem for you. Amazonite jewelry is beautiful and is recommended as a necklace, or earrings for example. Promotes great good luck in financial endeavors. Typical colours - dark green-torquoise blue with white streaky lines. 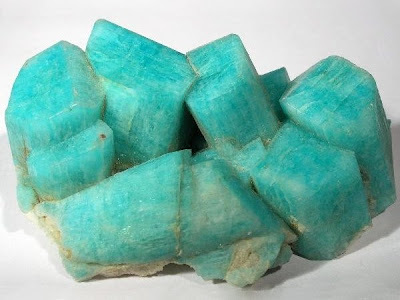 Amazonite (KAlSi308) is a form of pale green Microcline, a potash feldspar found in Brazil, U.S.S.R., and U.S. Like all other feldspars, Amazonite's energy works very well when combined with like stones such as topaz and aqua aura. Named for its place of discovery in the Amazon basin, this stone was believed to be jade for centuries. The parallel shadings caused by the presence of lead, give amazonite its intense color. The best crystals are found near Pike's Peak. It was used in jewelry in the India, Mesopotamia and the Sudan. In Egypt, amazonite was made into tablets in parts of the Book of the Dead and found in the tomb of King Tut. Amazonite is a gem found most commonly in Brazil, but also in Colorado, Eastern Canada, Italy, and Russia. It is named after the Amazon Basin because of its prominence in Brazil, though it is actually not found in that particular part of Brazil.